"The last I heard, we take our guidance from the White House, so you would need to follow up with the White House about press arrangements there. As I am not traveling with the delegation, I do not have the latest on logistics, so you would need to follow up on trip logistics with.. the UN Information Center in Washington. We are following up on your other queries." Beyond the statement on from where this UN takes its guidance, inquiry Monday with the White House revealed that while usually leaders who come to meet with Obama bring in their own press contingent, in this case the UN has made no request for any journalists to enter the White House with Ban. (It is not yet clear if the UN is bringing its own in-house UN Photo and UN Television.) On this basis, the White House press office's verdict was that "the pool is closed." Whether the new spokesman of the US Mission to the UN may re-open the pool - "c'mon in, the water's fine" -- is not yet known. He has at least asked a colleague to try. At 4:32 p.m., it was said that "the pool is pretty set," and that "no stakeout is expected since President and Sec. General like to give remarks to pool." For next in this series, still pre-White House, click here. Ambassador Susan Rice, after taking three questions Tuesday at noon at the Security Council stakeout, said she had to run to a plane to get to the DC meeting. 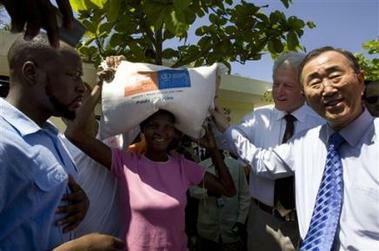 A request to the UN's Media Accreditation and Liaison Unit yielded that none of the reporters traveling from Haiti in Bill Clinton's plane with Ban and "a group of potential investors" planned to stay in Washington to cover Ban's visits to the White House, to the State Department and Capitol Hill. A request to the UN Information Center in Washington resulted in a belated response that while nothing could or would be done about access to cover Ban's White House meeting, "there are two press availabilities scheduled on Capitol Hill on Wednesday; one after the morning meeting with the House Foreign Affairs Committee, then a second after the afternoon meeting with the Senate Foreign Relations Committee. The Committees' respective spokespersons are handling the arrangements for those." By contrast, when for example the Greek foreign minister recently traveled to Washington and the UN in New York, her office brought a pool of journalists in tow, and stopped to answer questions, including from Inner City Press. How can it be that the UN, with an extensive Department of Public Information and Spokesperson's Office, claims it has no control over how reporters can have access to cover Ban's meetings with those he "takes guidance" from? We will be endeavoring to cover these meetings regardless. Watch this site. Footnote: It appears that in Haiti Ban did not, unlike the leader of the Security Council's trip Jorge Urbina who has said he will, raise the issue of the 107 UN Peacekeepers repatriated to Sri Lanka from Haiti for sexual abuse. But the sexual crimes version of the TV show Law and Order came and filmed at the UN on March 7, as the UN's Deputy Spokesperson Marie Okabe described in great detail on Monday. She named the actors and the characters they play, where they filmed in the UN and that the results will be shown on NBC on March 24 -- at 10 p.m. eastern. It sounded like an advertisement. Some say it will be good for the UN, to get it the publicity it seems to crave. But why then make no provision for UN correspondents to be able to cover Ban's meeting with Obama?